Home / Scouting Report / Rodney Anderson – Worth the Risk? Rodney Anderson – Worth the Risk? If you speak to some analysts, they may have Rodney Anderson as the top RB in this class. Others wouldn’t even consider him a first round rookie talent. 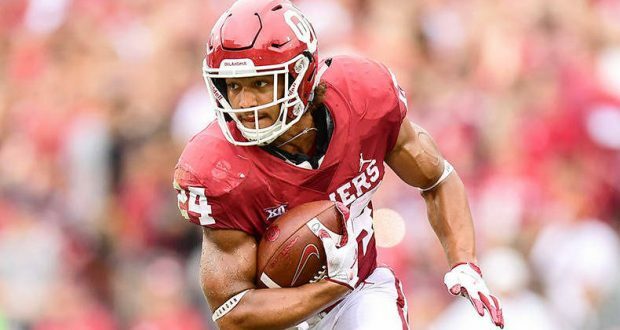 The 6’1” 220 Pound Oklahoma Running Back has injuries to blame for not unveiling his true potential. Anderson has shown flashes when he has been on the field for the Sooners, but he hasn’t been on the field enough to alleviate all worries. Anderson saw a backup role in his Freshman year as Samaje Perine led the charge. His Freshman year also came to an end early after suffering a broken leg. Anderson then proceeded to miss the entire 2016 season due a severe neck injury (fractured vertebrae). After Samaje and Joe Mixon were drafted by the Redskins and Bengals respectively, Anderson had his breakout season as a Sophomore in 2017 and looked to have all the tools that would take him to the next level. In OU’s last eight games of the 2017 season, Anderson went ballistic, averaging 134.9 rushing yards, 1.375 rushing TD, 1.75 catches, 31.75 receiving yards and 0.625 receiving TD per game. Every talent evaluator is now asking whether these are just freak injuries or if his availability, reliability and ability to take hits from imposing NFL defenders needs to be questioned. How can you accurately breakdown a guy who effectively played in just 9 college games over 4 years? 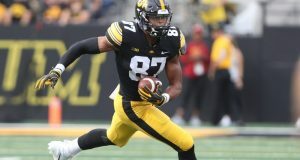 According to Bleacher Report’s Matt Miller, one AFC scout said that depending on the results of medical checks, Anderson “could be the top back drafted or not at all.” Despite the durability concerns, Anderson possesses good size and athleticism. He’s reported to run a 4.5 40-yard dash at his size. Furthermore, he has explosiveness to reel off big plays (6.4 YPC) and is more than serviceable in the passing game (281 yards receiving and 5 receiving TDs in 2017). According to Walter Football, Anderson “runs good routes, adjusts well to the ball, makes acrobatic catches, and has soft hands. While Anderson is not a burner back like Chris Johnson, Anderson has a combination of size, speed, and receiving ability that reminds this analyst of Arian Foster.” I also really like his running between the tackles. He has a Derrius-Guice type anger to him where he gets low for a big guy and is ready to explode through a linebacker. The most impressive notch on Anderson’s belt was his performance against Georgia. 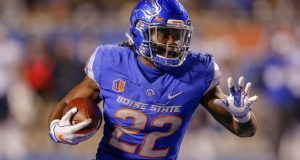 In the 2017 Rose Bowl, Anderson rushed for 201 yards and 2 TDs on 26 carries. Against a strong defense he looked a different class. Anderson’s dynasty rookie stock is tough to gauge. I think a lot will depend on how teams value Anderson in the NFL draft. If he’s a 6th or 7th round pick, then he could easily slide to the 3rd round of dynasty drafts. However, if he’s selected in the first 3 rounds, you better believe he’s sneaking into the 1st round. You better believe he’s a risky rookie selection. But, if you have the depth already where you can afford to take a risk on a high upside guy, Anderson may be right up your street. Previous: Opposing views: Is Allen Robinson a top 15 dynasty WR?